3:00 pm Arrive in the Minocqua area and check in at a hotel or resort. Take a stroll through our downtown area. Receive a Northwoods welcome from a destination that welcomes travelers of all kinds looking for an escape from the ordinary. 4:45 pm Depart for dinner at Chef Rene&apos;s at Timber Ridge Golf Club. Enjoy a wonderful dinner overlooking one of our beautiful golf courses. 715-356-7070. 3:45 pm Depart Lac du Flambeau. Return to hotel to rest and freshen up. 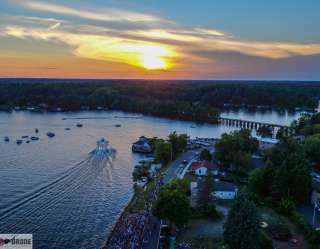 6:45 pm Depart for the 7pm Min-Aqua Bats water ski show on the shores of Lake Minocqua. Let these amazing athletes wow you with their amazing tricks. 10:00 am Depart for Minocqua Museum which features an ongoing display of the Island City’s unique history of logging and recreation. Step back in time and imagine what life would have been like in the 1880s when lumberjacks were quite literally carving out the Northwoods. What a wild and rugged place it must have been, and what wild and rugged people. 715-356-7666. 10:30 am—1:00 pm Arrange a group lunch at a fine establishment on the Island of Minocqua, or give tour participants a map and let them be on their own for dining and shopping in our quaint downtown. 2:00 pm Arrive at Northwoods Petroleum Museum — a pristine display of the private collection of more than 2700 pieces of service station memorabilia. The quality of this museum must be seen to be believed. 4:00 pm Depart Three Lakes to return to Minocqua. Arrive at hotel or resort to briefly freshen up for dinner. Return home with fond memories, a plethora of gorgeous pictures, and a host of new friends!